Bou Cou Loves You !!! 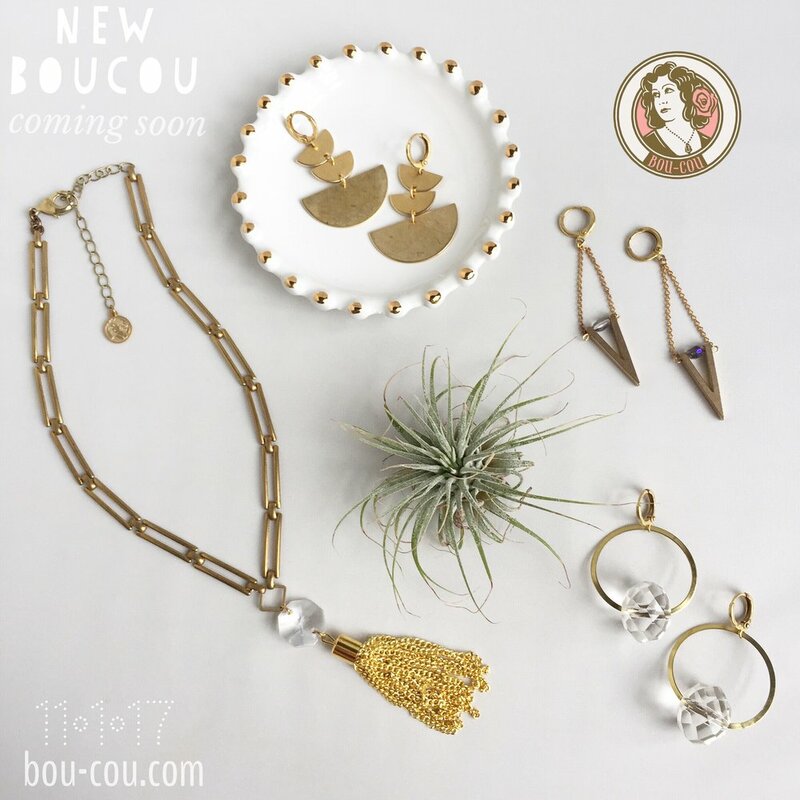 BOU COU ANNUAL HOLIDAY SALE!! Join us This Thursday December 6 from 5-10 for our annual Holiday SALE!!! Free gift with every purchase and small bites!! Can’t wait to see you!! New Necklaces uploaded in our online store! Come see us and order Bou Cou for your store! Don’t let all this rain get you down! Shop our new flower earrings to brighten your day! Our pink and blue enamel hoops are so adorable, and lightweight! Head over to our SHOP now and get a pair or two. NEW SALE SECTION in our Online Store! Hey guys!! We just added a SALE section to our online store!! Here you will find pieces that are super discounted. Still all of our favorites but we only have a couple or less left! Head over now to score some great deals! It is our favorite day of the whole year!! Once again it is time for our Holiday Sale!! We have super special discounts on this day only! Come get your holiday shopping completed in one stop and get a free ornament as a gift with every purchase! Can't wait to see you!!! We are SO excited about our Trunk Show on Black Friday November 24, 2017!! We will have almost every piece of our entire collection as well as one of a kind pieces!! We will be there at 8am-10am only!!! You don't want to miss out! Cant wait to see you there!! BLACK FRIDAY SALE GOING ON NOW!!!! We started our Black Friday Sale a day early!! Take advantage of 20% off your entire purchase in our shop before the items you have been eyeing sell out!! Yay!! We finally have all our items online for you to purchase!! Hurry over to our online store and check it all out!! Atlanta Apparel Market starts this week, Wednesday February 1 thru Saturday February 4! Retail Buyers stop by our booth 2-701 and see all our new boucou!! Pearl would love to see you! Its that time of year again for our Annual Bou Cou Holiday Sale!!! The one time we have a ton of boucou and we give a special discount as well as a ton of bou-cou on heavy markdowns. We have 2 displays of $5, $10, and $15 dollar items that would make the perfect stocking stuffers and gifts for all your friends and family this year. We hope to see you all!!! So excited! Check out this interview and podcast that Ray Waters did with Bou Cou Jewelry Owner, Becka Cowan. This was her first time doing a podcast interview. Listen to more of her story and hear what it means to her to have a Big Life! SO COOL to see BOU-COU in the November 2016 issue of Marie Claire Magazine!! Emily Kinney looks gorgeous in our Tiny Triangle Necklace. Get yours today in our shop! Only $28! Bring a little sparkle to your ears this season! We've created some beautiful new earrings that are sure to catch a few glances! Our favorite trend is chokers! Lucky for us, and for you, this trend doesn't seem to be going anywhere! We've got some great new chokers for your new fall outfits! We're getting ready for market this week at the Atlanta Apparel Mart! We'll be showing off some new pieces for Fall. Come by Booth 2-701 during October 6th-9th and check out all the new beauties we have to offer! We will be at ATS (Accessories The Show) in the NEST section from August 15th-17th in Booth #40805. The show will now be held at Mandalay Bay. We hope to see you there! Some of our new designs! Boutiques Showing Bou Cou Love! Fabrik Style is on point!